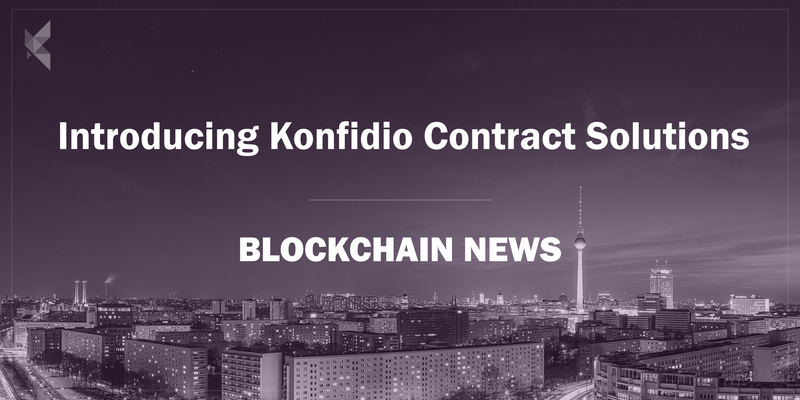 Today we are pleased to go public with Konfidio Contract Solutions (KCS), after more than a year of development in stealth mode. KCS, a venture out of our main blockchain development studio Konfidio, is using Distributed Ledger Technology (DLT) to make vast improvements on current systems of commercial contract management. Proof of Authority blockchain to which the data is immutably written, ensuring consistent and cryptographically secured data between all parties involved. KCS uses a Quorum implementation with a Proof of Authority consensus mechanism. The system is purposely designed to be a corporation friendly Private Permissioned Blockchain, which uses Ethereum as its underlying technology, but which is not publicly accessible on the Ethereum network. The system and its applications are controlled and validated by the parties implementing it within their organization, and has been built with a lot of room for customization to specific enterprises’ use cases. Last week we were pleased to go ahead with a successful testing of the Gershwin testnet (so called after our CEO’s wolf hound, once the runt of the litter and now a mighty beast!). We tested transactions using both Microsoft Azure’s cloud servers, and an internal network set up using nodes within our headquarters in Berlin. Most importantly, we were successfully able to use the graphical user interface on the application layer to implement the smart contract logic, which forms the heart of the contract management system. We have some exciting plans for this product going forward. We are in the early stages of our very own contract lifecycle with a Fortune 100 firm, as we are working to customize the KCS Enterprise Blockchain to their Managed Services contracting lifecycle. On the back of successful internal testing, we intend to go ahead with test deployment in their enterprise environment before the end of May, and aim to go into fully-fledged production before the end of 2018. At the firm in question we saw a legacy system hamstrung by unsynchronized and contradictory database systems, which was leading to huge and unnecessary costs. Having completed an initial POC and rapid prototyping stages together with the client, we were sure that the blockchain, placed at the heart of a well designed system, could make exponential increases in efficiency. Our testing so far has continued to prove that this is indeed the case. Over the next few days we will be giving visitors to the Future Blockchain Summit in Dubai a first glimpse of the product. For those not lucky enough to be in the UAE this week, soon we will be releasing a deeper dive into the world of contract management, and outlining how we will be solving some of the most pressing problems faced by organizations today.